Today was Day #2 of Chocolate and Toffee Theme Week. 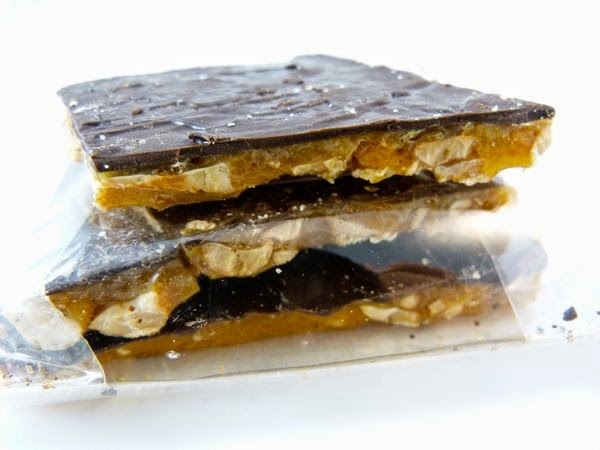 There is a fine line between toffees and brittles in the U.S. Both are sold as crunchy, caramel-colored shards of sweet goodness, usually with nuts. They are close enough that I'm including today's brittle in Toffee Theme Week. 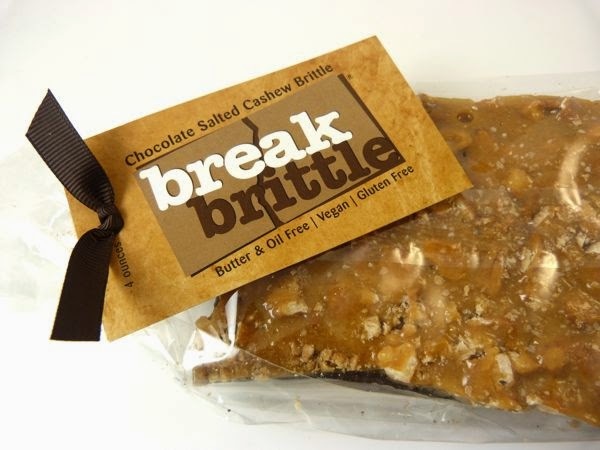 The Chocolate Salted Cashew Brittle from Break Brittle (San Francisco, CA) was gluten free, vegan and butter and oil free. So how was it? As brittles go, it was quite nice. The pieces broke with just the right amount of fresh, sugary candy crunch. There was no cream or oil to buffer the sweetness as there might have been with some toffees. The sweetness overwhelmed the dark chocolate layer on the back and the milder, roasted cashew nut bits. This was pure candy. I did really enjoy the sprinkling of kosher salt that added a layer of flavor and helped balance the sugar. Part of the philosophy of Break Brittle is to be able to break off pieces of this confection to share with others. And, I will surely pass this on to candy lovers I know for a taste.